We strive to create a supportive, nurturing partnership with parents which will contribute tangibly to each child's academic and personal growth. We believe the initials of our school, CMS VA, reflect three basic concepts of Montessori philosophy: Concentration, Motivation, and Success. From the moment they begin to speak, children are driven by an innate desire to master the skills of everyday life. "Me do it" is a refrain every parent hears, whether it be to put on a shoe or pour their own drink. In Practical Life* lessons, the child's drive to master the world is harnessed to the maximum. 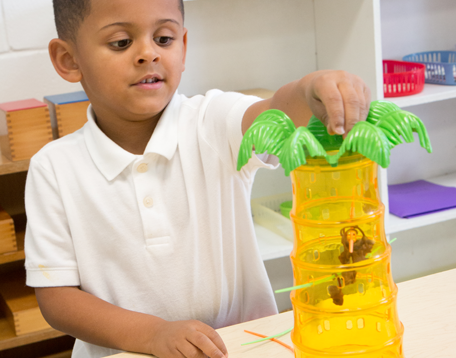 With exercises such as pouring, spooning, and sorting, children learn control of movement. These exercises also develop deep concentration and a sense of order. Repetition is one of the keys to success and children are free to repeat the tasks over and over as long as their inner need dictates. They graduate to increasingly more complex tasks as their attention to detail improves. Self-control develops as a result of the interest and concentration in this specially prepared environment. Since the children work from their own choice without pressure or coercion, they learn to make decisions as they develop both initiative and independence. The Montessori method reveals the child as an enthusiast of order and intellectual work, capable of concentration and eager to learn for the joy of learning. Dr. Maria Montessori was the first woman in Italy ever to become a doctor. She believed we should "look to the child" to observe the way they approach the world. As she applied her keen powers of observation, one discovery followed another, giving Montessori an increasingly clear view of the mind of the child. She found that little children were capable of long periods of quiet concentration, even though they rarely show signs of it in everyday settings. 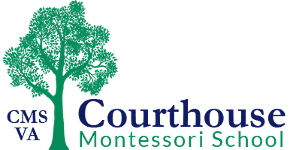 Dr. Montessori trained teachers to pay close attention to children's spontaneous behavior, arguing that only in this way could a teacher know how to teach. Traditional schools pay little attention to children as individuals and expect a child to adapt to pre-set standards and curriculum. 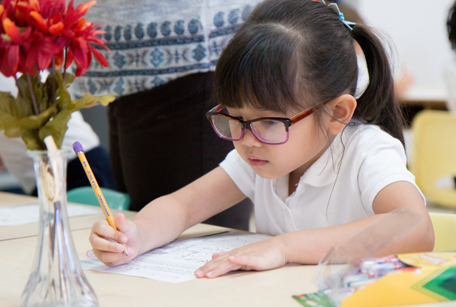 In a Montessori classroom, a combination of three elements combines to develop the child's maximum potential: 1) an observant teacher; 2) a carefully Prepared Environment;* and 3) the child's own Absorbent Mind. The classroom contains special manipulative materials designed for maximum appeal and effectiveness which take advantage of children's natural tendency to experience the world through their senses. At CMS VA, these specific Sensorial Materials* serve to hone visual discrimination skills, develop abstract concepts such as superlatives (big, bigger, biggest), and provide indirect preparation for writing and reading. One of the cornerstones of the Montessori Method is the recognition of children's urgency to learn specific activities at each stage in their development. These stages that children pass through are called Sensitive Periods. * During these cycles, the child readily absorbs a particular type of knowledge often showing an unusual aptitude for that particular skill. *Terms marked with this asterisk were coined by Dr. Maria Montessori. Heralded as the century's leading advocate for early childhood education, her research and studies helped change the course of education. Many elements of "modern" early childhood education have been adapted from Montessori's theories. She is credited with the development of the open classroom, individualized education, manipulative learning materials, and educational toys. At CMS VA we strive to guide our students to become self-confident and independent thinkers who learn because they are interested in the world and enthusiastic about life. The Montessori Method of teaching focuses on a child's own initiative and ability. Children experience a lesson through active participation. Children experiencing a Montessori education are allowed to progress at their own pace. This reduces frustration for the child who needs more time to grasp a concept and reduces boredom for the child who advances more quickly. The teacher in a Montessori based classroom is an observer of the child. Teachers direct and guide children through sets of lessons, each building upon the other. The teacher introduces more complex concepts after the child has mastered the basics and will build upon this knowledge when the child is ready. This approach encourages success, independence, and self-determination. When building a block tower, the foundation must be strong or the tower will fall. The same can be said for children. If they lack a solid foundation, they are unable to become the strong, independent learners they are capable of becoming. The Montessori Method is designed to bring out the best in a child.